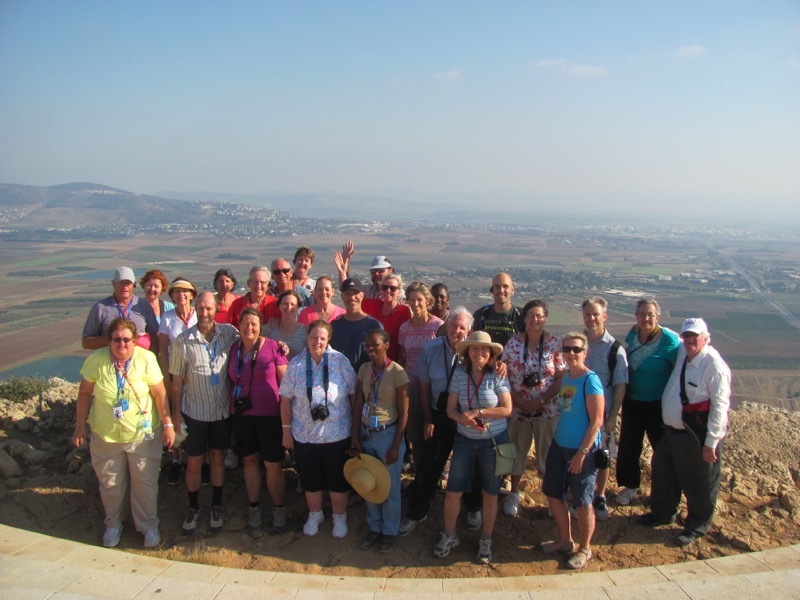 The departure day finally arrived for our Christian Tour to Israel! God brought together a total of 28 for this tour. Most of the group met at the Philadelphia Airport for a night flight to Tel Aviv. Others (including 6 new friends from Australia) arrived at various times. Flying into the Ben Gurion Airport (named after Israel’s first Prime Minister), the majority of the group were greeted by our Amiel representative as well as Dr. John, Shlomo Ben Asher (our Israeli guide) and David (our driver). Once proceeding out of the airport and loading the bus, we made a brief stop in Jaffa (Joppa). While there is not much to see here, we were introduced to the concept that everywhere we go in Israel, we literally “touch” the Bible! We read from Jonah 1 and Acts 9 & 10 here, two places that mention the ancient city of Joppa. The Mediterranean – Tel Aviv coastline is beautiful here. Just a few miles south is our hotel. After checking in and refreshing a little, we met for dinner together. This as followed by an orientation dinner. An optional walk was enjoyed by most on the sandy beach of Bat Yam. We are looking forward to our first full day tomorrow when we head south through the Shephelah to the Negev. Today was our first full day! We were greeted by sunny skies and temps in the 70s. Highs today would be in the 90s. Following a great breakfast and check-out t the hotel, we loaded the bus and headed south. We would spend the day in the Shephelah (“Lowlands”) of Judah. All of today’s sites were “off-the-beaten-track” sites, with all pertaining to the Bible in some direct way. The first site was Gezer. Located in the Ayalon (Ajalon) Valley, Gezer was a city taken by Joshua from the Canaanites (Joshua 12), but later re-taken/controled by the Canaanites (Judges 1), only to be conquered by Shishak, the Egyptian Pharaoh (1 Kings 9). The city was re-fortified by King Solomon. We saw the “Middle Bronze” (or Canaanite) tower and gate, the Iron Age (or Solomonic) gate, and the “standing stones” (mesabot), probably used in cultic/religious practices. We also saw a replica of the famous Gezer Calendarand read from Ecclesiastes 3. We even saw a jackel here! Driving to the next valley (the Sorek Valley), we stopped at Beth Shemesh. Climbing the “tel” (ancient mound), we read from 1 Samuel 6 about the Ark of the Covenant being returned by the Philistines here. We could see the story unfold before our eyes! We also remembered the life of Samson, who grew up nearby and took Delilah, a Philistine living in Timnah, as his wife (Judges 13-14). The next site was Kh. Qeiyafa. This is a site recently excavated in 2007-2013. We climbed to the top of this 5 acre Iron Age “fortress city” (probably established by King David). On the way, we saw to gazelles! At one (of two) city gates and overlooking the Elah Valley, we read from 1 Samuel 17. The story of David vs. Goliath took place right below us. The site was probably ancient Shaaraim (1 Samuel 17:52). Here we were encourage to face our “battles” in the same strength and confidence in which David faced his. Continuing south the Beit Guvrin/Moreshah (where we had lunch and for some our first falafel), we visited the Roman amphitheater, the columbarium (e.g. “pigeon hole” cave) and one of the bell caves. In this cave, we listened to Shlomo play his recorder. We also enjoyed a time of worship. We read from Micah 1 (the prophet was from Moreshah). Our last site of the day was Lachish. We talked about two invasions of this city, the first by the Assyrians (in the end of the 8thcentury BC), and later by the Babylonians (at the beginning of the 6thcentury). Here is where the famous “Lachish letters” (ostraca) were found. We read from Jeremiah 34:7, rejoicing in the accurate historicity of the Bible in light of the wording of Lachish letter #4. Most in the group also climb the tel and stood on top of the massive stone palace (built here by Rehoboam) as well as on top of the fortification wall. From here we drove about 50 minutes to the main city in the Negev, Beersheba. We checked into our hotel about 4:45, giving some free time until dinner (pool, naps). Following dinner we gathered for a brief meeting of reflection and worship. It was a great first full day here in Israel! Today was another typical “weather day” here in southern Israel, with sun and temps in the mid 90s, manageable though because of the dryness of the air. After a great breakfast spread, left our hotel again a little after 7:30. Our first stop as Tel Beersheba, located just outside the modern city today. Here we read from Genesis 21 about Abraham and the “covenant” he made concerning the “well.” Even though the well doesn’t date to his time, the shepherd imagery can be seen, as God fills our “cup” to overflowing like a Good shepherd (Psalm 23, John 10). At the site we saw a Solomonic gate, storehouses, a 4-room Israelite houses, a cistern system, and a replica of the stone altar found here in the 70s. Driving south to Sde Boker, we visited the grave of Ben Gurion, Israel’s first Prime Minister. His grave overlooks the Wilderness of Zin. Here we saw many ibex (Psalm 104). Driving into the Zin canyon, we then enjoyed a hike to the waterfalls. It was amazing to see all this water in such a dry and desolate region that only gets 4-6 inches of rain/year (less the further south you go). Many in the group hiked up to the canyon rim on the other side, enjoying popsicles after the climb. After lunch in Avdat, we drove further south to Israel’s “grand canyon,” Machtesh (“crator”) Ramon. It is really a geological wonder. In the visitor center, we also saw a few video displays about the machtesh. Returning north, we visited Arad. Located in the eastern region of the northern Negev, Arad was a Canaanite city (Numbers 21) with the earliest ruins dating to the Early Bronze period. Later it was destroyed by Joshua (Joshua 12). The reforms of both Hezekiah and later Josiah brought an end to the Temple built here. This temple, discovered in 1962, revealed an altar and even a “holy of holies” chamber constructed with similar proportions to Solomon’s Temple in Jerusalem. We read from 2 Chronicles 32 and Romans 12:1-2. Driving east into the Judean Desert, we ended the day by arriving at Hanokdim, a Bedouin village. First we enjoyed a camel ride, followed by a hospitality gathering led by a Bedouin. After dinner we enjoyed a time of reflection and fellowship out under the beauty of the stars. Tonight we are sleeping in huts! It sure I a unique experience! Today was a hot day, with sunny skies and temps around 105-110. But it was a great day, starting with Masada. After breakfast (and a great sunrise to the east), we loaded up the bus and drove 15 minutes east to this huge palace/fortress built by Herod. We read Psalm 18:1-2 along the way (God is our fortress – “metzada”). Many walked up the Roman ramp, while others bussed around to the other side and rode the cable car to the top. Shlomo shared the “Masada” story with passion. We visited the southern cistern and palace, the western casemate rooms, the synagogue, and the bathhouses. 11 in the group walked down the Snake Path (before it closed due to the extreme heat). Driving 15 minutes north along the western coastline of the Dead Sea (reading Ezekiel 47 on the way), our next stop as Engedi. We read from Song of Solomon 1, 2 Chronicles 20, and 1 Samuel 24. We could picture this last narrative (David and Saul in the cave together) since this area is filled with caves. We hiked back to the second water falls, with a few enjoying getting refreshingly wet. To see all this water in the middle of the desert was remarkable. Continuing north, we visited Qumran. Following lunch here, we visited the ruins here. The Dead Sea Scrolls were found here in 1947 (and later), miraculously preserving the Word of God in written form. The Essenses were the scribes of these scrolls. Overlooking “cave 4,” we read from 2 Timothy 3:16, Psalm 19, and even the “extra” psalm found here, “Psalm 151.” Before leaving, we also drove over to the northern cliff area where we hiked to “cave 11” (where the Temple Scroll was found). It as a unique experience to actually go into one of these Qumran caves. Jericho was our next stop. We climbed the “tel” and reviewed the many stories that happened here as recorded in the Bible. Here we saw the actual revetment (retaining) walls of this double-walled city conquered by Joshua (Joshua 6). It was on top of these walls that the mud-brick wall was built, the part of the wall that “came tumblin’ down.” Thank God for the historicity of His Word! We ended the day to the Dead Sea. Many enjoyed floating this mineral/salt water. It’s impossible to sink! From here we drove nearly two hours to Netanya, an Israeli city located on the Med coastline. So ascending from Jericho 4,000 feet to and Jerusalem, and then descending westward towards the coast, we arrived at out hotel for a late “erev Shabbat” (“evening of the Sabbath”) dinner. It was a great meal! It was another sunny (predictable this time of year), but with more comfortable temps (high 80’s-low 90’s). We checked out of our hotel in Netanya and headed north to Caesarea. It was Herod the Great who built this grand “harbor city.” Sitting in the theater, we remembered the boldness of Peter (Acts 10), and Paul (Acts 26). It was also here that Herod Agrippa died (Acts 12). We sang a few songs together. We also saw Herod’s palace, the hippodrome, Roman bath-houses, many mosaics, and the harbor area. Before leaving the site, we also visited the aqueduct. About 45 minutes inland, we drove to one of the highest peaks of the Mt. Carmel Range. This is where Elijah confronted the 450 prophets of Baal. We read from 1 Kings 18 (as well as from Isaiah 35:1-2 and Song of Solomon 7:5). The view of the Jezreel Valley from here was spectacular. We could see many stories form the Bible unfolding from here (e.g. Deborah/Barak, Judges 4-5; Gideon (Judges 6-7), Saul (1 Samuel 31). Following lunch on Carmel, From here we drove to Megiddo, the most strategic city in the region. Megiddo guarded the primary “pass” into the city from the south. We climbed the site, seeing numerous gate structures, storehouses, grain silos, and altars. We read from Revelation 16 (“Armageddon”) and celebrated the fact that God has the “end times” in His control. He has a final word! We left the site by descending 180 steps down through the water system. Our last stop was to the “precipice” of Nazareth. Here we read from Luke 4 and John 1. We were invited to “come and see” Jesus. We listened to Andrea Bocelli’s rendition of The Lord’s Prayer as we sat in reflection together. We drove from here about an hour to Nof Ginnosar, our “kibbutz-hotel” for the next three nights. Coming upon Tiberias, we got our first panoramic view of the Sea of Galilee. After checking in, we enjoyed dinner together, followed by an optional gathering on the shoreline of the lake. We are looking forward to two full days up here in the north. Today we headed north to the Golan Heights. Leaving again at shortly after 7:30, we first drove from the NW corner of the Sea of Galilee to the NE corner. Climbing in the bus into the Golan, we looked down to the Plain of Bethsaida. Although the location of Bethsaida is in question, this was still where the feeding of the 5,000 took place (John 6). From here we drove to nearby Gamla (“camel”). This city was the first city defeated in the First Jewish Revolt by the Romans in 66 AD. Among the ruins is a 1stcentury synagogue. Although we could not actually drive down to it, we got a good view of it from above. Jesus no doubt taught here! Perhaps “Judas the Galilean” was from here (he led a revolt in 6 AD. See Acts 5). Katzrin was the next site we visited. This was a “Talmudic” village (3rd– 7thcentury AD). Here we sat in the reconstructed house of “Rabbi Abun.” We read from Mark 2 and could see the story come to life! We rejoiced that Jesus has authority (Hebrew – “S’mekah”). Driving north we drove to the border with Syria. We heard Shlomo speak about the 1967 and 1973 wars and the extreme importance of the Golan Heights to Israel’s security. Close by in a Druze village, we enjoyed lunch. In the afternoon we visited Mt. Hermon, Israel’s highest mountain (7,300 feet). The mountain is mentioned a few places in the Bible (Psalm 142:5-6, 33:1-3; Song of Solomon 4:7-8). Perhaps the “Transfiguration” took place somewhere on the slopes of the mountain too (Matthew 17). This is also where Israel’s ski resort is. We took the ski lift up and down, enjoying a spectacular view. 4 in the group hiked down the trail. We then descended from the Golan to Dan. On the way, we passed by Caesarea Philippi, remembering that it was “in this region” where Jesus asked, “Who do you say I am?”(Matthew 16). This was a pagan city, one of which Jesus would not have entered. On the other hand, Dan is a nature preserve today as well as an archaeological site. This is one (and the largest one) of the three tributaries of the Jordan. We walked through the forest, taking time to reflect along the quiet sounds of the water (Psalm 42). We saw the “high place” set up by Jeroboam (1 Kings 12), continuing a pattern of disobedience set in the time of the Judges here (Judges 18). We also saw a Middle Bronze “mud-brick” gate, perhaps one that Abraham walked through (Genesis 14:14). We ended the day by driving u the Naphtali mountains to Misgav Am. The view of the Huleh Valley below is great from here. We also looked into Lebanon (1/2 mile away). We read 2 Samuel 20 (about Abel Beit Maacah located below) as well as heard modern history about Lebanon from Shlomo. We drove back south the Nof Ginnosar for dinner and a free evening. It was a great day, with sun and very comfortable temps (80s). Today was a day of focusing upon the life and ministry of Jesus. While this summer heat wave continued (95-100) with a bit more humidity, it was a great day. We began at 7:35 again, with the first stop being Mt. Arbel. About a third of the group hiked to the top (70 minutes), while the others bussed around and walked to the top from the west. The view was hazy but it still gave us a spectacular perspective of this NW corner of the Sea of Galilee below. We considered the parables of Jesus (Matthew 13). Driving back through Tiberias, we stopped at Magdala. Here we saw another synagogue (one of seven) that date to the 1stcentury. Although not mentioned in the Bible (other than “Mary Magdalene” was from here), Jesus no doubt taught here himself. We also visited the new chapel, complete with beautiful mosaic reliefs. We enjoyed singing here in the rotunda. Staying on the NW corner of the lake to visit to more sites, Chorazim was next. Mentioned as one of the three cities condemned by Jesus (Matthew 11), we visited the 3rdcentury synagogue. This one was made from basalt. We read from Matthew 23 about the “Moses seat” found here. A visit to Capernaum followed. We read from Mark 1, 2 and 9; Luke 7; and John 6 abut all that happened here. We visited the synagogue (5thcentury), saw ruins of houses (1stcentury – Jesus’ day), and the 5thcentury church. We spent a few moments of reflection on the shore line. Following lunch (some had “St. 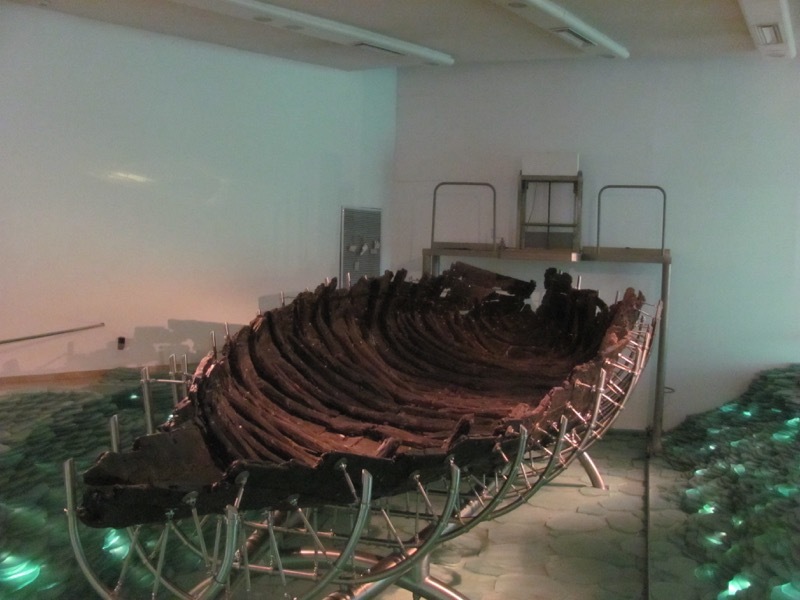 Peter’s fish), we saw a restored ancient boat from the 1stcentury (found in 1986). We then enjoyed a time of “sailing” on the lake, worshiping together, and reading the two “storm” narratives (Mark 4, Matthew 14). Driving to the southern end of the lake, 11 in the group reaffirmed their baptismal vows in the Jordan River. It was a special time for all. We ended the day by returning to the NW corner and the Mt. of Beatitudes. It has recently been suggested that this may have been where Jesus preached his first sermon. We listened to the Hebrew version of Matthew 5. Judy followed by offering a memorized rendition of the entire chapter of Matthew 5. Following the reading, most in the group walked down the path to almost the water’s edge. It provided a meaningful time of reflection. We returned to the hotel for dinner and a free evening. Some in the group enjoyed swimming in the lake. We look forward to Jerusalem tomorrow night! Today we left Nof Ginnosar for Jerusalem. This morning’s weather was unique, with the eastern wind (Psalm 78:26, Isaiah 27:8) bringing in dust and a very overcast sky (it would be dusty and hazy all day long). After packing up and loading the bus, we drove to the southern end of the Sea of Galilee for our first stop, the “Kinneret Cemetery.” Here we heard about the life and poetry of a certain “Rachel.” Shlomo shared her story and a few of her poems. From here, we drove south in the Jordan River Valley to Beth Shean. This was a huge Roman city and one of the “Decapolis.” In the days of the OT, it was also where Saul’s body was hung (“on the walls of Bethshean” 1 Samuel 31). We saw many things here, including the Roman street (the Cardo), bath-houses, and theater. Some climbed to the top of the tel for a great view of the city below. Nearby we made another “surprise” stop at Sachne.This is a spring-fed (the Ein Harod spring… Judges 7) “swimming hole.” We cooled off in the water here for about an hour. It was really enjoyable. We also made a brief stop to see the 6thcentury AD mosaic floor of Beit Alpha. The details of the mosaic is quite amazing. We watch a brief (and humorous) video that explained the mosaic. We returned to the Beth Shean area for lunch. Leaving the Jordan Valley, we now cut inland through the Samaritan hill country to Shiloh. The Ark of the Covenant resided here for 369 years, according to the rabbis. We climbed the tel and saw a wonderful presentation of the Biblical story of Hannah, Eli, and Samuel (1 Samuel 1-4). We saw the suggested flat area where the Tabernacle was. We read from Jeremiah 7:9-14 about God’s warning like in the days of Shiloh. Continuing to drive south, we went close to such cities like Shechem (Genesis 33-34), Sycar (John 4), Bethel (Genesis 12, 28, 34) and Michmash (1 Samuel 13-14). Once we intersected with the Jericho-Jerusalem road, we turned west and made our final ascent to Israel’s capital. We checked into the Dan Botique hotel, our home for the next 3 nights. After dinner many joined in an optional walk to the Western Wall. We look forward to our first full day in Jerusalem tomorrow (and we hope the dust/haze will lift, but unfortunately it is predicted for the next day or two). Today was clearer than yesterday, with temps around 90. The dust in the air settled a bit. We left the hotel again at the usual time (7:30 or so). We drove to the Mt. of Olives. The view of the Temple Mount and Old City from here was spectacular. We walked down the narrow street to Dominus Flavit. Here we read from Luke 19 and Zechariah 14 about Jesus’ first and second coming. We also recalled the ords from Ezekiel (Ez. 44:1-2) that speaks about the Eastern Gate. From here our walk continued to the Garden of Gethsemane. We read Luke 22 and reflected together about the passion of Christ. It was a quiet moment of considering the ultimate sacrifice of Jesus for us. We walked into the Old City through the Lion’s Gate (also called St. Stephen’s Gate). Our first stop inside the city was St. Anne’s Church and the Pools of Bethesda. We enjoyed singing in this Crusader church, with a 8-10 second echo. We also read from John 5 about the miracle that took place here. The Via Dolorosa begins nearby. We read from John 19 (about Jesus being condemned to crucifixion on the lithostrotos – “stone pavement”). Although this “way of the cross” was most likely from the opposite direction, it was interesting to see so many following the stations to the Holy Sepulcher Church (one of two possible locations for both the crucifixion and burial area of Christ). Here we explored this 4thcentury church on our own before lunch in the Christian Quarter. After lunch we walked through the Jaffa Gate, and boarded back onto the bus. We drove about 7 miles SW of Jerusalem to Herodium. This “palace-fortress” was the burial place for King Herod (he died in 4 BC). We climbed this “artificial” mountain, built by Herod himself, to the top. We read from Isaiah 40 about the Judean Wilderness. Next, we stepped through the cistern system. We also saw the area where Herod’s tomb was found. Driving towards Bethlehem, we made a stop in the Shepherds’ Fields in Beit Sahour. We entered a cave, where we considered that “God sent His Son… just at the right time” (Gal. 4:4). We also sang a few Christmas carols here as well as in the chapel. We sounded like angels!! Next, we drove into Bethlehem proper where we visited an olive wood store. We had an opportunity to do some shopping here. We also saw how these products are made. We ended the day with a “surprise” visit to Shlomo’s community. We enjoyed some cookies and drinks while Shlomo shared some information about his community as well as other “current events” insights. We drove back to the hotel for dinner and an optional walk to Ben Yehuda Street. Here we enjoyed a taste of modern Israeli life. It was a great first day here in Jerusalem! It was another great day here in Jerusalem! Temps were comfortable (80s) with hazy but less-dusty skies. Starting at 7:30 again, we drove just a short distance to the Old City. Entering the Dung Gate, we visited the Western Wall Tunnels. We walked parallel along this western “retaining wall” of the Temple, seeing one Herodian stone as big as a bus and weighing 500 tons or so. The Temple sure was a “magnificent” building (Mark 13:1-2). We spent the rest of the morning in the Jewish Quarter. We visited the Temple Institute and learned about the preparations, by certain a sect of Jews, to build the Third Temple. Next, we enjoyed hearing Moshe, an Orthodox Jew, talk about his faith. Many purchased items from his shop (Shorashim), all related in some way to the Bible. We enjoyed lunch in the Jewish Quarter as well. Walking out of the Zion’s Gate, we boarded the bus and drove to the Israel Museum. First, we saw a 1:50 scale model of Jerusalem. It was helpful to understand what Jerusalem looked like at the time of Jesus. Next, we walked through the Shrine of the Book. Here we saw fragments of the Dead Sea Scrolls from Qumran (including the Temple Scroll from Cave 11 that we saw and entered last week!). 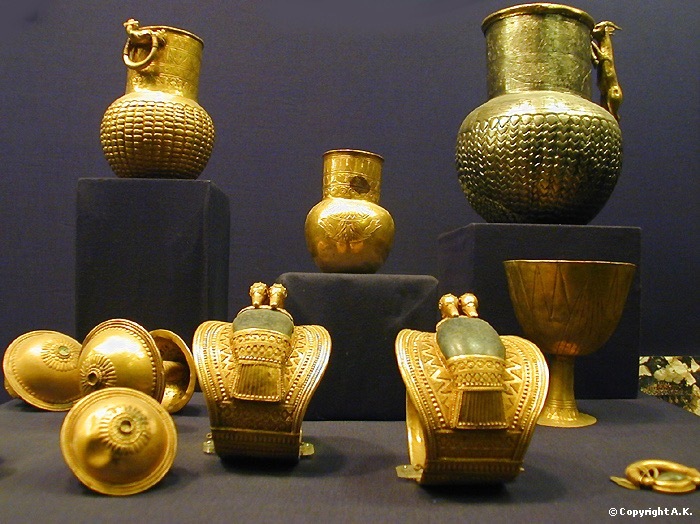 Finally, we saw the “highlights” of artifacts in the archaeological wing of the museum. This included the Dan inscription, the Arad holy place, some of the Lachish letters, the “Moses seat” from Chorazim, the ossuary of Caiaphas, the “Pilate inscription,” and the sarcophagus of Herod the Great, among other things). We ended the day at Yad VashemIsrael’s Holocaust Museum & Memorial. We heard Shlomo share about his family (he lost 12 family members in Vilna, Poland). We visited the Children’s Memorial and walked through the museum on our own. It was quite moving, yet sad at the same time. Today was our last day in Jerusalem. The weather was pleasant, with highs again in the 80s. Enjoying sleeping in a bit and departing an hour later today (8:30), our first stop was the Garden Tomb. This site run by English believers provides an alternative location for the crucifixion and burial site of Jesus. After touring the premises and seeing the tomb, we enjoyed a time of worship and communion. We read from John 19 & 20. Since we worship the “person” rather than the “place,” we rejoiced together in the accomplished work of Christ for us! Our next site was the City of David. As mentioned in the Bible (2 Samuel 5), it was David who conquered the city from the Jebusites. We saw the excavations of the eastern slope of the city, including ruins from First Temple days. Walking further down the eastern slope, we next entered Warren’s Shaft. We carefully descended through what was initially proposed in the 70s & 80s as the “water shaft” used by Joab to conquer the city (this view is no longer held). This led us to the huge water tower structure (Canaanite and Israelite) that guarded the spring. At the Gihon Spring, most in the group entered Hezekiah’s Tunnel (mentioned in 2 Kings 20 and 22 Chronicles 32). This is a 1,720 foot-long tunnel chisseled out of the bedrock. Made by Hezekiah in advance of Sennecherib and the Assyrians, it was amazing to walk through. Others took the dry Canaanite tunnel. We converged at the Pool of Siloam where we sat on the steps and read John 9 (in dramatic fashion J). From here, 10 walked up the Herodian drainage channel all the way to the south-wall excavations while others bussed up. We met at the SW corner of the Temple. Here we saw the massive Herodian street and the massive stones of the Temple toppled down by the Romans in 70 AD. We considered various stories from the Gospels of people who would have entered the Temple from the southern steps (Luke 2 & 18, Mark 12, John 10, Acts 2). The rest of the afternoon was free to either grab a bite to eat or explore. We all had various experiences in the Old City, from shopping to people-watching. We returned to the hotel at 4:45. 14 in the group refreshed for the flight back tonight. Leaving the hotel at 6 p.m., a farewell dinner was enjoyed in Abu Gosh before driving the rest of the way to the airport for the 11:30 p.m. flight home. The rest in the group (those going to Egypt tomorrow morning and “land only” travelers staying an extra day or two) enjoyed dinner at the hotel. It was a great last day in this special city! This morning back in the US, 14 people in the group landed in Philadelphia. Catching connecting flights, it was a day of traveling home. For others who stayed in Jerusalem, it was a good day for exploring the city. For six of us, we got up at 4 a.m. for our van ride to the airport. By 8 a.m., we boarded our plane to Amman, Jordan, and then to Cairo, Egypt. We were greeted by our agent, driver and guide (Heba). Hard to believe that we just arrived on a whole different continent (Africa!). With our agent providing an easy procedure in leaving from the airport, we boarded our Travel Plus van and began our afternoon tour. Our first stop was Old Cairo.We visited the Ben Ezra Synagogue. It dates back to the 9thcentury and is the oldest Jewish place of worship in Egypt. There are an estimated 150 Jews who still live here in Cairo. Close by was the Abu Serga or “Cavern” Coptic (which means “Egypt”) Church. This church structure goes back to the 4-5thcentury AD or the Byzantine period. Tradition places Joseph, Mary, and baby Jesus coming here in their escape from the evils of King Herod back in Judea, but again, this is only tradition. From here we battled the absolutely crazy Cairo traffic, driving to get at least a picture of the Citadel and the Mosque of Mohammed Ali. While the mosque dates only back to the 1800s, the citadel was built by the Arab invader Sala’din in 1183 AD. Driving to our hotel (5 star + called Semiramis Intercontinental) was quite interesting, once again a challenge with Cairo traffic. But the slow-going provided a great opportunity to see “average” Egyptian life in this over-crowded and poor city of 22 million people. 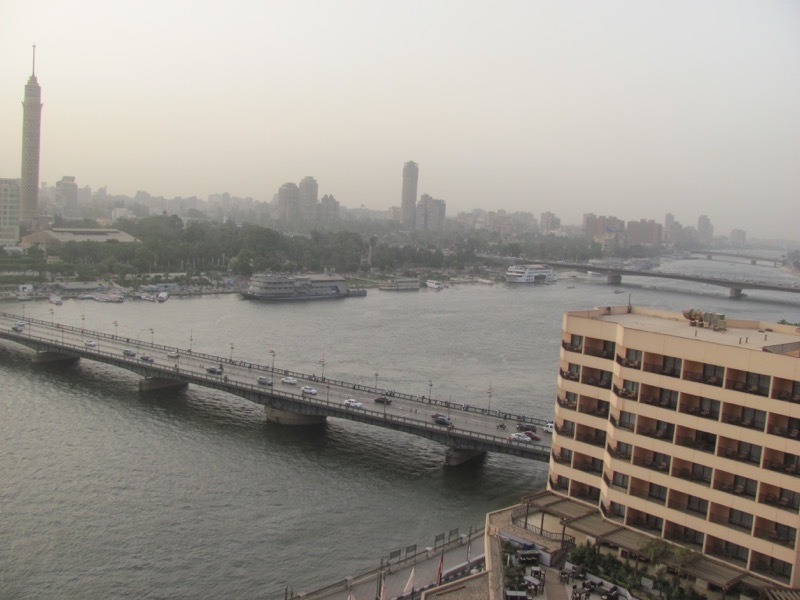 The view of the Nile River from our hotel rooms is amazing! The sunset was beautiful! We checked into our hotel at 5 and enjoyed two hours of relaxing time before driving to our “dinner cruise” on the Nile River. We enjoyed a “night on the Nile” cruise, gaining of unique perspective of this busy city. We returned to the hotel, ready to get up early for our flight to Luxor tomorrow. We are looking forward to our first full day here in Egypt. 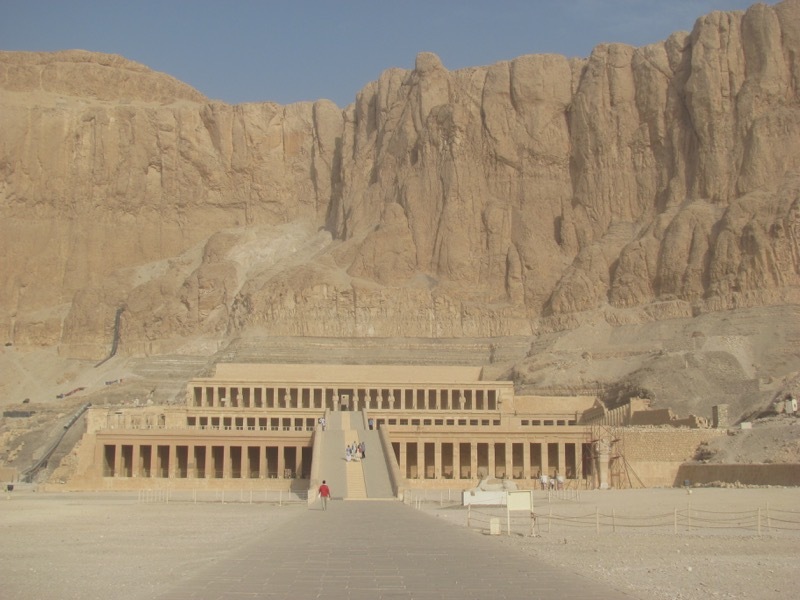 Also on the west side of the Nile is the Valley of the Kings & Queens. 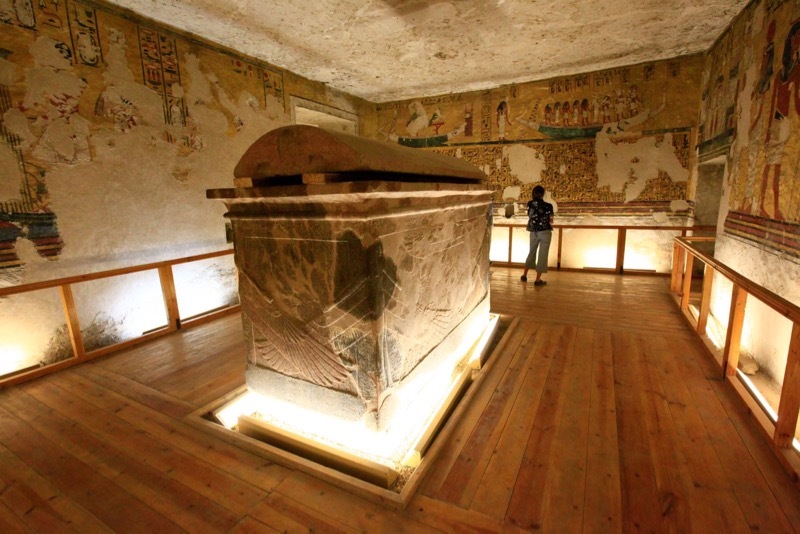 67 tombs of the Pharaohs and 6-7 tombs of the queens have been located to date. This includes the tomb of King Tut, Thutmose III, Nefertari, and many of the Ramses’ family. We went into the tombs of Ramses IV & IX, Septah & Tawesret (in Valley of the Kings), and Seth-her-khopsef(in Valley of the Queens). The later was a son/prince of Ramses III. A fetus son was also displayed her. Before leaving the west side of the Nile, we also visited a stone & alabaster store. We saw how they hand-make beautiful vases, etc… We also saw the Colossi of Memnon (Greek name for Amenhotep). From here we took a small boat across the Nile River. We enjoyed lunch at the Sonesta Luxor Hotel. It was a nice break from the hot sun. In the afternoon we visited two massive temples on the east side of the Nile, the first of which was the Temple of Karnak. It was Thutmose I who brought the capital of Egypt here to Thebes/Luxor. According to Egypt mythology, Amon-Ra, the chief god, resided here in the Temple of Karnak. Leading up to the temple, we saw part of the impressive street decorated on each side with sphinx with ram’s heads. This street connected this temple with the temple of Luxor for 2 miles (with 3,000 sphinx). In the temple saw the hypostyle chamber of Seti I and Ramses II, complete with 134 columns) as well as the relief of Thutmose III depicting his 17 military campaigns. We also saw reliefs of a certain peoples’ group known as the Habiru. This relief may preserve the coming of Joseph to Egypt. We also saw a few obelisks as well as the “holy chamber” of the Temple, complete with an altar. Finally, we visited the Temple of Luxor. High statutes of Ramses II can be seen here, preserving his great battle victory at Kadesh. Many “papyrus-style” pillars still stand tall. At 6, we boarded our plane back to Cairo. Arriving in Cairo an hour later, we once again we greeted by our agent and van. We drove back to the hotel along the Nile for a late dinner. It was a hot but very exciting day in Luxor! Today was our last day. It was a sunny and more comfortable day, with highs around 90. 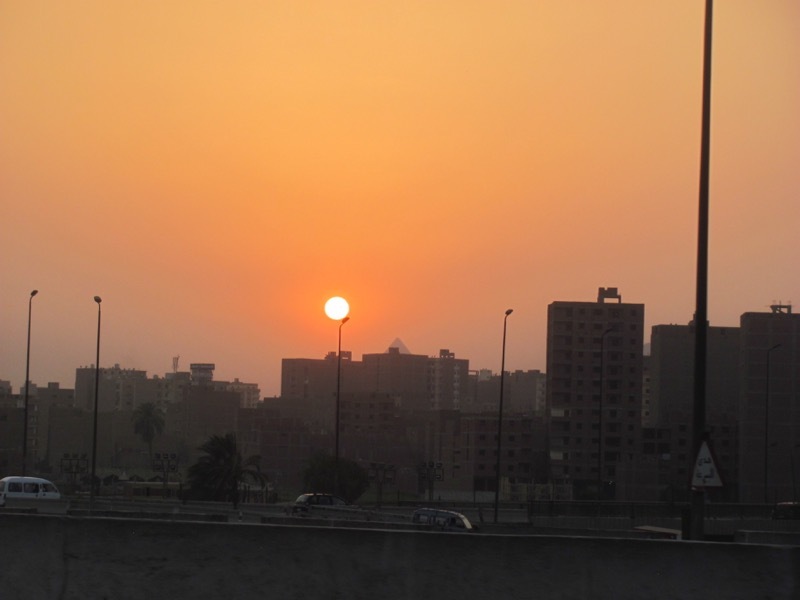 Leaving the hotel at 7:30, we first drove to Memphis, the capital of Egypt in the Old Kingdom. During the drive we saw just how poor these parts of Cairo really are. Although not even comparable to Luxor’s grand temples, we still saw some impressive statutes here at Memphis of Ramses II. Close by was Sakkara, the stepped pyramid and the oldest of about 120 now found throughout Egypt. Following a visit to the museum (and seeing an impressive mummy), we first entered the ancient Egyptian tomb of Ptah, one with unbelievable wall reliefs of the greatest detail. Next, we entered into a smaller pyramid, descending down into it about 50 before coming to the sarcophagus far underneath. Next, we enjoyed a closer view of the Sakkara pyramid itself, the burial place for King Djoser (about 2,700 BC). To think this pre-dates even Abraham (by 600-700 years) is amazing. Before leaving the area, we made a quick stop in a carpet-making school. It was very interesting to see and her how carpets are made. The next stop was the famous Egyptian Museum. We spent about an hour and a half here, seeing some incredible artifacts from Egypt’s past. From statutes of Thutmose III, to the Hathor bull (e.g. “golden calf”), to the Merneptah stele (which mentions the ‘Israelites”), the most impressive was King Tutankhamen’s treasures. A special room is set aside to display the “golden mask” and other artifacts from his tomb in the Valley of the Kings. After lunch (a quick bite to eat at Egypt’s version of our “7-11”), we drove to Giza (again a very impoverished area) to the Pyramids. With the largest of the three standing about 500 feet high, it is actually indescribable. 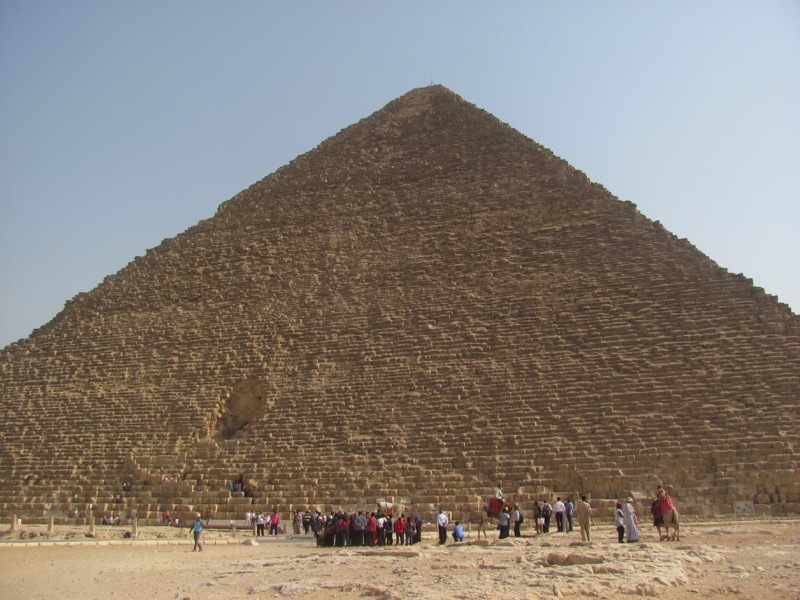 Made of 2.3-2.5 million stones, each of the weighing around 2.5 tons, the pyramids live up to their “seven wonders of the world” status. After a panoramic view of them, we entered the third/smallest one. 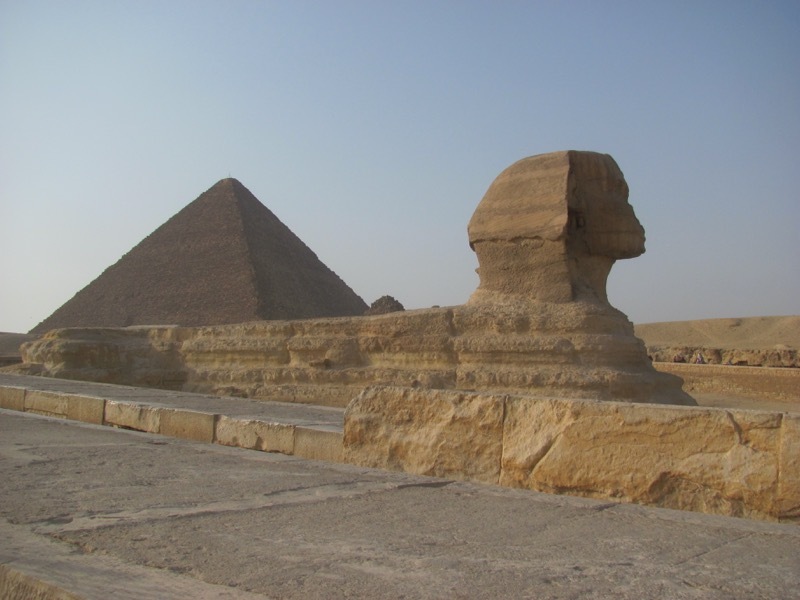 We also saw the Great Sphinx nearby as well. We drove back to the hotel, but not before stopping in a Egyptian cotton stores as well as a papyrus store. We enjoyed a relaxing dinner together. We retired early since we all have to get up early for our various flights home. It was a great last day here in Cairo! We boarded our respective flights home from Cairo. It was a great extension! Glad to be safely home!